The Alto was the first system to pull together all of the elements of the modern Graphical User Interface. The Alto was designed and built by Xerox for research and, although Xerox donated a number of them to various organizations, they were never sold. 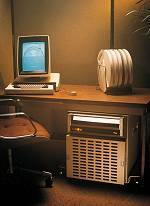 The Xerox Alto was designed to be a relatively small, yet powerful, personal office computer with the ability to present information graphically, and to easily share information. They were also designed to utilize laser printers that were also under development at Xerox. A 606*808 tall monochrome bit-mapped video display. Optional 5-key chord key set. Large 2.5 megabyte removable disks. 16-bit microcode programmable CPU custom-built from TTL chips. A total address space of 64 K 16-bit words (128k bytes), including the graphics bitmap. Using memory bank selection, a total of 256 K words (512K bytes) was possible. Initially the Xerox Alto software was not "desktop" oriented and was more comparable to a system with various pieces of mouse enabled graphical DOS software than, say, Macintosh or Windows. The following are some screen dumps of an Alto system. This is what you would see right after the system boots. Yup, that's a command prompt. This command environment is called the Alto Executive. This is a directory listing of some files on a local disk. A similar environment, called the Net Executive can load programs from across a network. It uses long file names that are NOT case sensitive. Each disk "page" (sector) identifies what file the page belongs to. Using this information a program called Scavenger can easily recover damaged files. The Executive has escape expansion and file-name completion. Typing a question mark after what you have already typed, the Executive will display all file names that match what you have typed so far. This is the Alto file manager. Its name is the "Neptune Directory Editor." It uses the mouse, graphical buttons, and file lists, but no icons or pictures. Note the use of the mouse buttons for file management operations: "Select file names with the mouse. Red-Copy, Yel-Copy/Rename, Blue-Delete. Click 'start' to execute file name commands." On some of the mice the buttons are colored red, yellow, and blue, although others were all black. Of course the programs weren't perfect. This is a screen dump of the debugger after a crash.